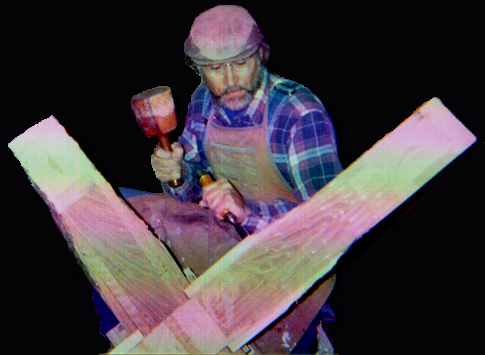 I have been creating liturgical sculpture and furniture from wood since 1979. My designs usually have simple, graceful forms which allow the elegance of line and pleasing proportions to serve as the primary decoration. My clients have an active participation in the design process, so that the final product will be as much a reflection of their tastes, needs, and aesthetic values as of my own. My commitment to high quality in both material and joinery techniques, together with my philosophy that form follows function, assures pieces that are useful and pleasing to present and future generations. I prefer to work with domestic hardwoods because I feel rooted here in the Appalachians and because of the rich colors and textures available in local hardwoods. I depend on the grain patterns and natural colors of the materials to enhance the beauty and flow of the design. I try to leave the final finish as natural as is practical. I usually start the finish process with deep penetrating oil that enhances and protects the wood, and then give a final coat of a more enduring and protective quality. As a sculptor I use both additive and subtractive process. Most of my free standing sculpture is subtractive; that is, I start out with a piece of wood and remove all but the final form. Most of my furniture is made using traditional joinery techniques. In both cases the flow of line and proportion are very important.